The other day a friend texted me that he just walked past a store at the mall that must be my idea of hell. They sell geodes and incense and the sinus-inflaming smell fills the whole corridor on the way to the movie theater. My reply was "I can knit a geode." I had seen one on oddknit.com so I knew it could be done. Jessica Goddard also studied physics and seems to have the same philosophy of knitting that I do. We approach it like science, technical problems to be solved. If it turns out artistic that's just a bonus. This is the tutorial which is over an hour long and details all the trial and error aspects of this project. It's not a precision job with a gauge to meet and it will come out perfect. You have to have a bit of finesse to get it right. I will update the pattern and make a better PDF later. I have some other stuff I have to do first. 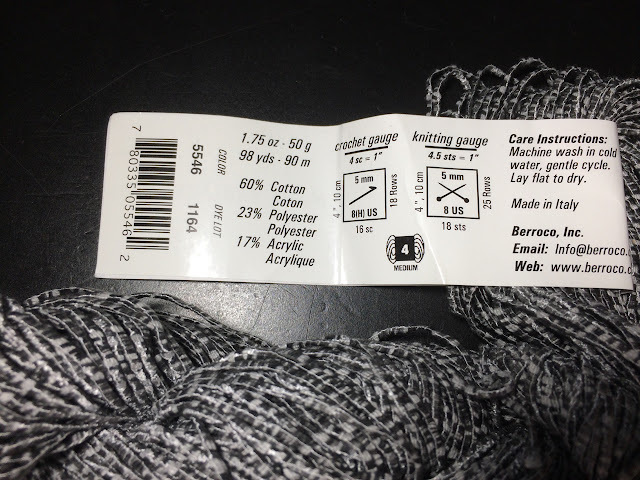 The ODDknits pattern is good and has an illustration for how to join the edges. You can try my version if you like a balanced lifted increase better than a kfb. 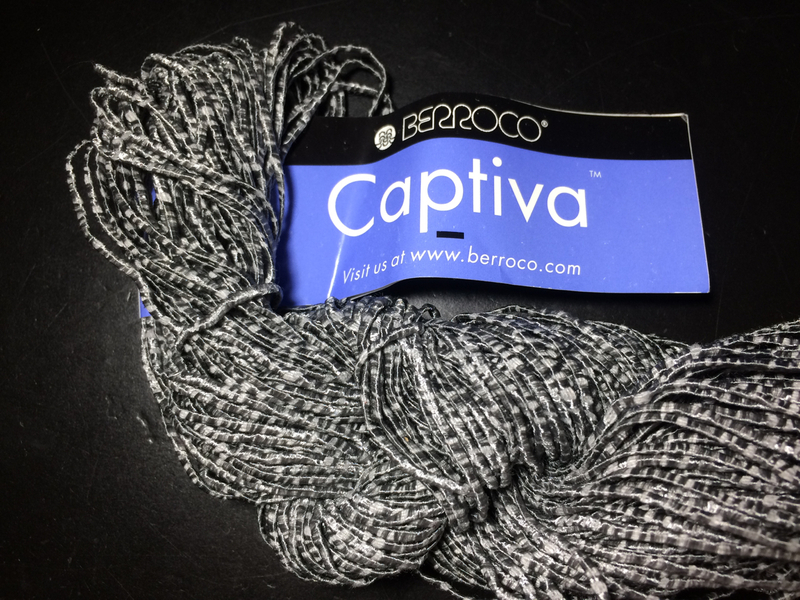 Also I worked my inner layer with worsted weight. Here's a link to the PDF of my Numbers spreadsheet and here it is embedded. The basic premise is to knit a hemisphere, then knit two rings and sew them together. Then there are two more hemispheres. 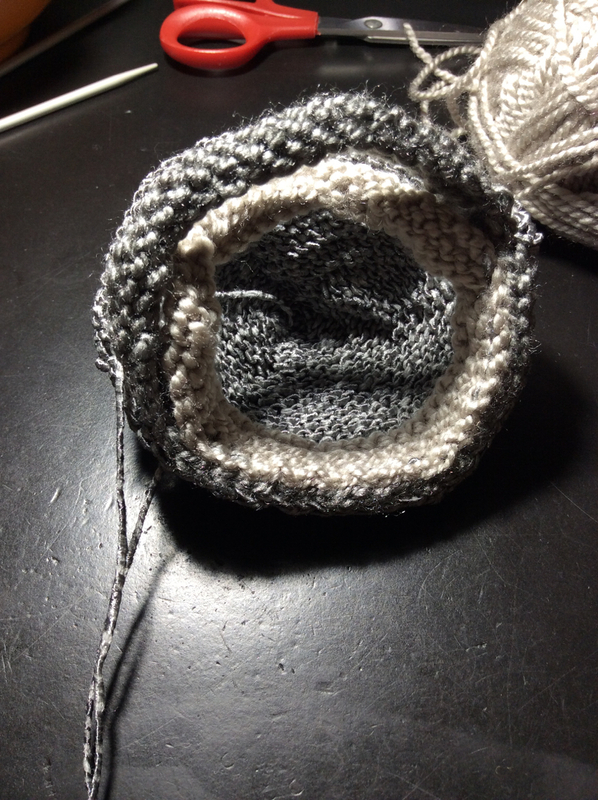 The outer hemisphere is knit with a 6 wedge increase. 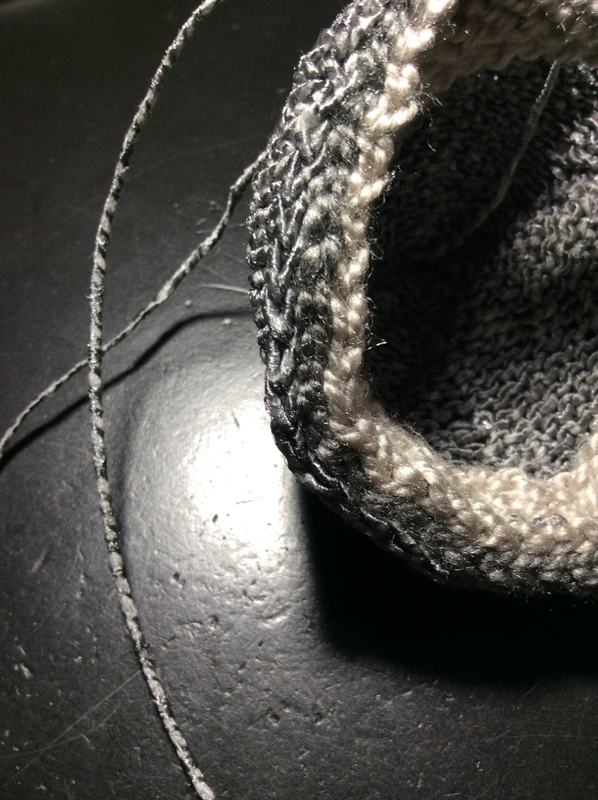 The two layers of the edge are each 6 stitches smaller in circumference. I knit them all on the same size needles but with different yarn. 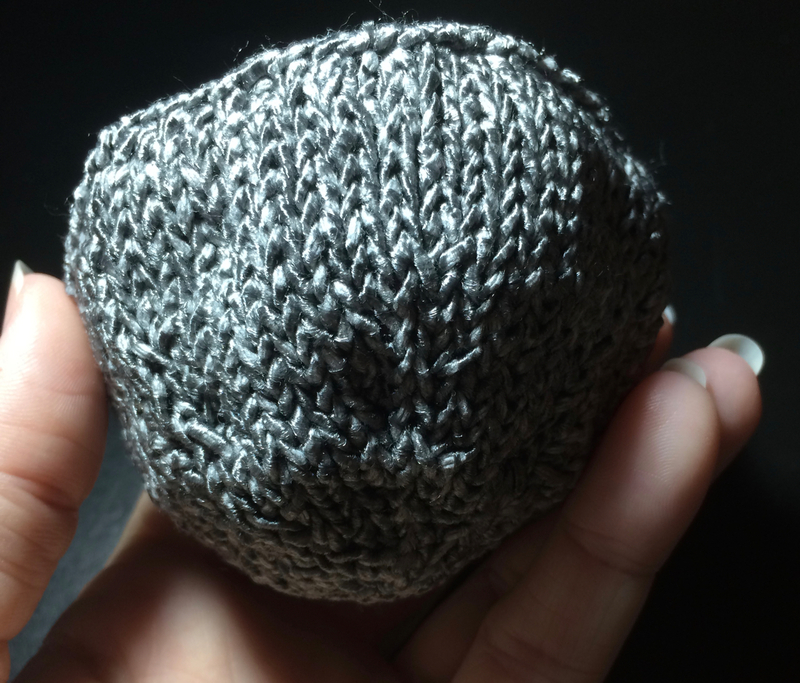 The inner hemisphere I knit by test. I guessed it would need two less decrease rows than the outside done in heavier yarn on twice as big needles. I had to finish it and test it to see I had 10 stitches too many. Then I frogged back to the right number of stitches and worked straight rows up to the edge again. 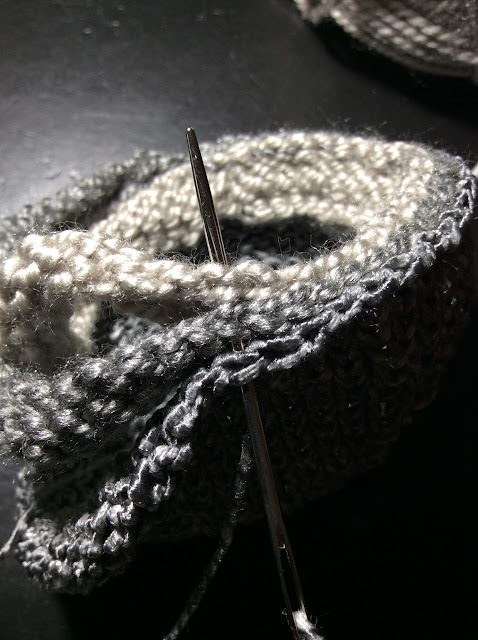 I had to frog the bind off a second time because it was too tight. I went up 2 needle sizes and the bind off was perfect. This is a trial and error situation. Embrace it. I included some bean bag filling between the layers of the geode. 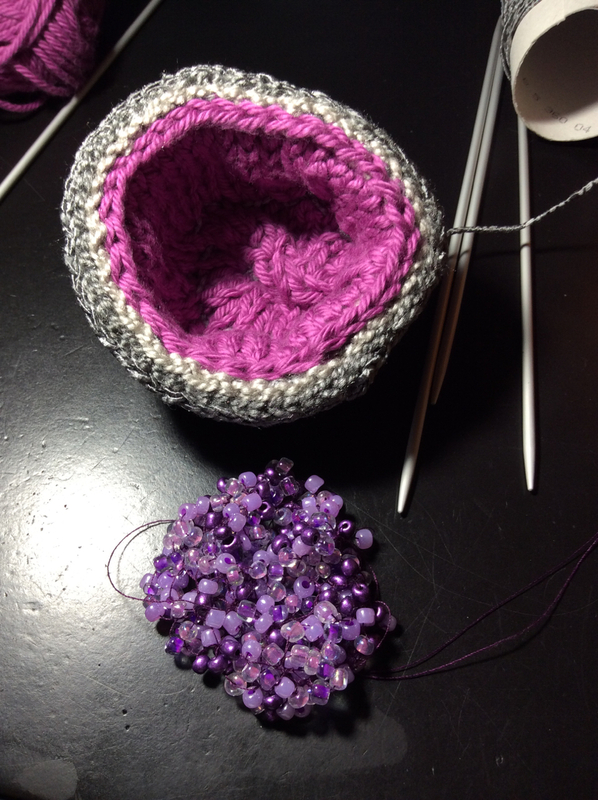 I sewed the inner layer into the geode first to see what it felt like. 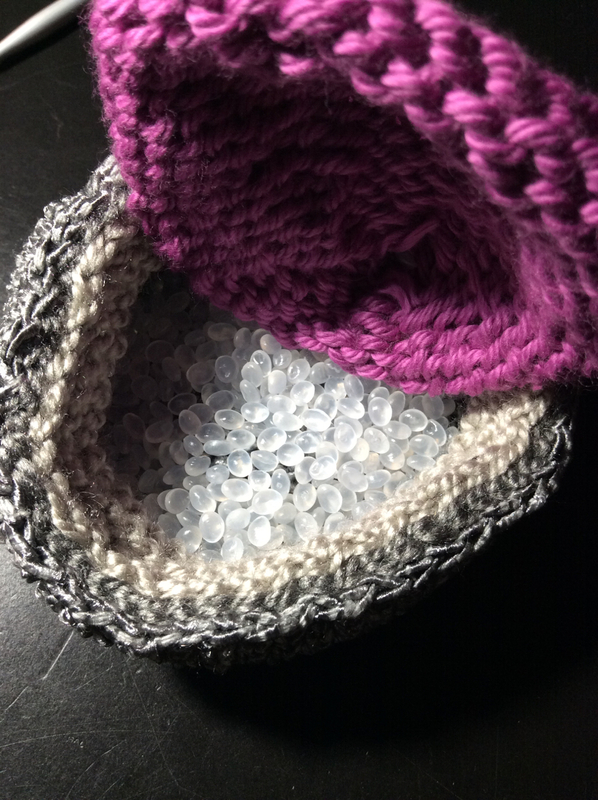 Jessica of ODDknits sewed her two inner layers together first then joined them. I had to straight wing it on the beaded section. 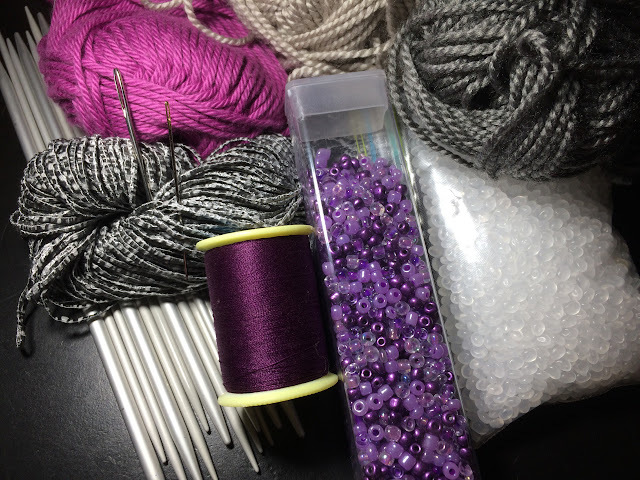 I couldn't fit the beads I had onto any of my yarn. I had to thread them on polyester sewing thread and knit that. I did it all by feel and then just tried to finish with a number of beads that would match up with the stitches on the inner ring. Embroidery thread might have been easier to knit. This geode really blew up on Twitter this afternoon. @KimLincolnMusic suggested I should make another one so they could zip together. That's brilliant. Zipper would really need to go in place of that outside piece of edge knitting. I may have to do two more halves. The first one took me two days so a whole one could be a week long project. I may be able to use magnets and reuse this first half. I'll update when I work it out. I did make the zippered geode and you can see it in the video in Part 1. I am still working on some other stuff to go with it. It needs a dragon or turtle or something to hatch out of it. I also started knitting the moon Mimas with the leftover yarn. 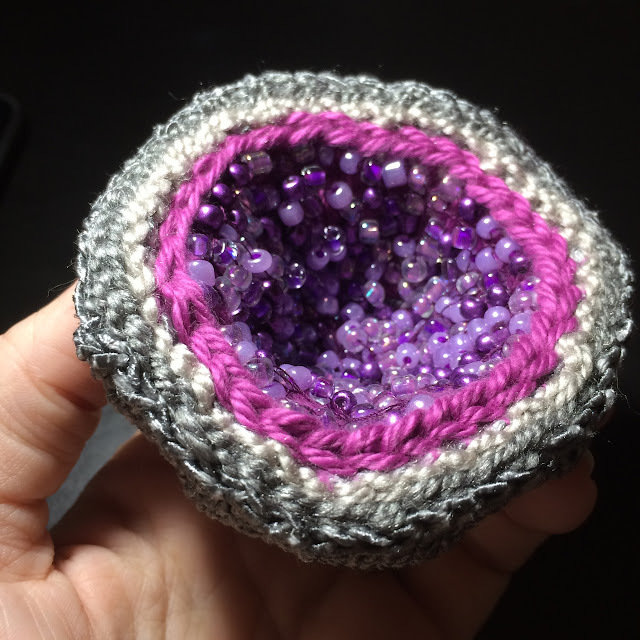 If it comes out I will include both of these in the updated PDF of the geode pattern.